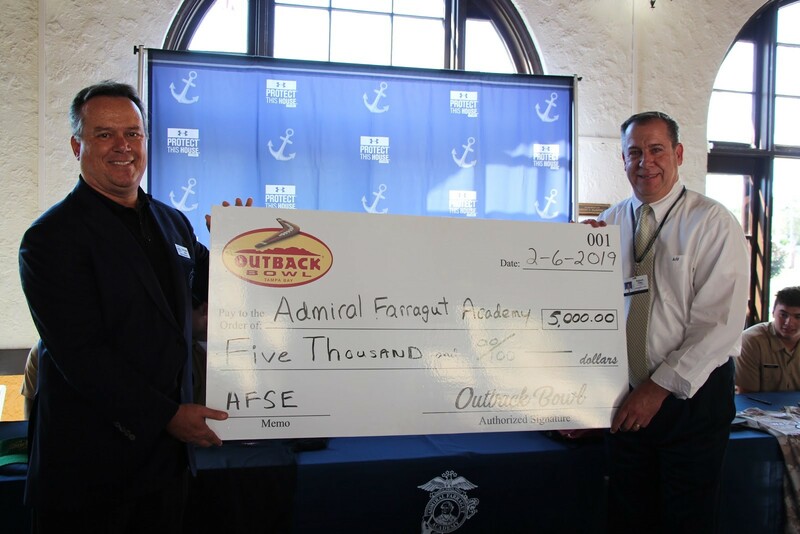 Saint Petersburg, Florida – During Admiral Farragut Academy’s Athlete Signing Day on Wednesday, February 6th, Christopher Giblin presented a check for $5,000 to the Farragut Fund from the Outback Bowl. Christopher, who is a parent to a Farragut 5th grader, sits on the Outback Bowl Board of Directors. The Outback Bowl, featuring teams from the Big Ten Conference and Southeastern Conference, is played in Tampa’s Raymond James Stadium and celebrated its 33rd game on January 1, 2019. Over its history, it has brought more than a million out of market visitors to the region while creating an estimated $1 billion in economic impact and distributing $148 million to universities. It has also contributed over $1 million to Tampa Bay area charities since 2016. For information on the bowl go to www.OutbackBowl.com or call 813-874-BOWL. The Farragut Fund covers annual expenses above what tuition and fees provide. These philanthropic dollars are used to enhance faculty and staff compensation, augment facility professional development, increase tuition assistance, and add additional resources for the Academy’s signature programs of STEAM, Aviation, Marine Science, Sailing, and Scuba. For questions or more information about charitable giving to Admiral Farragut Academy please contact Chief Development Officer Tony Sloan at tsloan@farragut.org or call (727) 384-5500 ext 278. Christopher Giblin presents $5,000 check from the Outback Bowl to Admiral Farragut Academy and Headmaster Robert J. Fine, Jr.